Will it be long before Stagecoach London is Trident free?After all the newest examples are 8 years old now. The 103 & 175 recently had their contracts renewed with New/Existing. So I'm guessing these could possibly be the last ones In service. Looks like you're not a fan of the Scanias First already had plans for the DN's and therefore they were not offered for sale. And I think we can be reasonably certain that Stagecoach like them to some extent otherwise they would probably have made more of an attempt to get rid of them (but then again refurbishing existing buses vs buying/leasing new generally saves costs which is favourable when trying to win a contract). Of course the 252 is meant to be part-E400 on paper so it is still possible to get E400's if you are lucky, although I would probably agree with you about the crap seats, it is a shame they didn't put any extra padding in like London United did with their refurbished ones, but either way they look like brand new buses from the photos I've seen. No idea why your surprised Stagecoach didn't buy the First London Enviro 400's - First still have older deckers to remove from service across the country. The Omnicity DD's aren't the most comfortable mostly due to the fact they have hard suspension but having rode one of these refurbed buses, they do seem to be a little more comfortable so can't really blame the seats. As for seating capacity, they have just two fewer seats downstairs than an Enviro 400 & the same number upstairs so it can't really be poor. I would like to know what you mean by not good enough. Retaining the Scania's allows them to make a lower bid as it's 'existing vehicles' and they are still relatively young vehicles. They are really poor quality buses, they look cheap and tacky and their performance is not much better. What the hell is with the lower deck layout? What are those two seats at the back downstairs! You say only two seats fewer, but the vehicles are longer than the short wheelbase E400's yet have a lower seating capacity? Makes no sense. They feel big and bulky, unlike the Enviro's soft, flexible, tidy and better configured design. Lets be fair, to me Scania are not in the same league as E-vehicles or Wrightbus. Stagecoach can't like Scania's as they never purchase them - they have always turned to Dennis for their vehicles since low floor buses began operation in double deck form in 1998. Its true that Stagecoach won the contract because they have these existing vehicles from the 106 and that helped keep the price down. They must have realised that Blue Triangle would otherwise have had a chance from Rainham - and the route would have been operated by nice new Gemini 2's! Rainham has 7 new 63-reg E400's for route 252 that has a PVR of 12. Therefore, the service is around 50-50 with Scania and E400, although 1 or 2 drift onto the 365! These 7 were part of an order of 19, with the other 12 going to Leyton for the 179. Interestingly, you say the ex-106 vehicles have been refurbished, which they have. Unfortunately, the 248 versions (I think there are 15?) havent, and they drift to the 252 and 365 as well as the 248! You can tell the difference not only by the seat covers and flooring, but by the top of the front (above the front upstairs window) which is still black. The ex-106 vehicles that have been re-sprayed have pained these red now. The Tridents were excellent vehicles, I would have preferred to see them ont he 252 rather than Scania. Scania's are actually know for good performance and as I said, I rode on of the batch your on about the other week on the 248 and it was driven very quick. The reason why the downstairs rear is like that is because Scania position their engine vertically rather than horizontally. They are not longer than a LWB Enviro 400 - LWB Euro IV Enviro 400's are 10.8m which is the same length whilst they are shorter than LWB Euro V Enviro 400's which are 10.9m & LWB Euro VI Enviro 400's which are 11m. The Scania's have less seats to give better legroom - more noticeable if you sit upstairs. Not sure why you assume that Blue Triangle would of used Gemini2's if they won the contract - BE are hardly know to use nice, shiny buses, just take a look at the 498! Stagecoach outside of London have plenty of Scania buses so they pretty well equipped in how to deal with them. I understand your point, but where exactly is 252 going to get Tridents from? All the Tridents are slowly being withdrawn and they also not manufactured anymore. 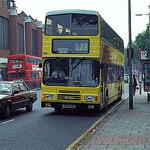 The only last example of Tridents is allocated to route 47 (that is the 55/06 Reg Tridents). By 2016 or 2018 when the route is re-tendered, those Tridents on 47 may be replaced with new buses and the current Tridents may be withdrawn or be used on school routes. Back to 252, please remember that they just started a new contract and the route to use existing Tridents e.g 53 Reg could be withdrawn quickly. In this case, maybe Stagecoach wanted to save money and the 58 Reg OmniCities on the route are only 5 years old, they're currently fine. It's more about the costings and quality of buses in this case. If we are being fair then you would acknowledge that Stagecoach as a business go through phases as to what they buy as their "standard" buses. Huge numbers of Olympians and step Darts / Volvo B10Ms. Then a move to Dennis Tridents and low floor Darts plus MANs / Volvo B10BLE. Then they moved on further to Enviro 300s on AD / Scania and MAN chassis with lower numbers of Enviro 200s and Optare Solos. Double decks moved to lwb E400s for city work but Enviro 400 Scania double deckers for rural / interurban work. Scanias have had a long standing good reputation for comfort and acceleration / powerful performance - one reason why Scania Metropolitans are one of my favourite buses. For me there are two mysteries with recent Scania double deckers - the poor ride quality and the truly dreadful staircase design which I think is dangerous. I assume Scania have had to compromise ride quality against achieving a legal vehicle weight and a low floor. I also do not think we can be certain what Stagecoach would have done in terms of vehicle purchases for London if it had not sold out to Macquarie. 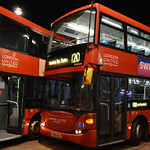 It strikes me that Scania offered London operators some very attractive deals given the vast numbers of N94s and N230s that have been bought by Metrobus, London United, ELBG and even CT Plus. I suspect quick delivery times may also have been an attractive feature for some operators. It's possible that Stagecoach might have gone for Scanias if a good deal was struck. Given they buy large numbers of them for provincial fleets, including Gold services, they must think they're decent vehicles. It's obvious you like Tridents but they're on their way out. Stagecoach have some of the better ones as they tend to look after their fleets. I don't see Tridents carrying on on any contracts unless TfL get to the point of waiving the vehicle age limit in order to save money. Nothing is going to change with the Romford area work that Stagecoach have recently won so get used to the Scanias. I thought the refurbed ones looked very smart when I saw them recently. I didnt know the enviro lengths are slightly different with different euro engines. London Bus routes suggests the LWB Euro 4 ones are 10.5m? Maybe not in London but they do appear to be the new bus of choice in certain provinces. Stagecoach East Kent have quite a few Scania E400s down in Canterbury. I am guessing that's Scanias are generally more beneficial on the urban/country hauls in comparison to the Dennis Trident. All the speed bumps and potholes on London's road's in the past few years can't help the suspension on these scania's? The PD one's on route 51 for instance are well thrown about down Swingate Lane. They are very basic buses part of me likes them in a way though, I have been on every one of PD's omnicities from when the 51 was one of my local routes.